The Pittsburgh Pirates have scored the sixth-fewest runs (388) and have the fourth-fewest hits (826), tied for fourth-worst slugging percentage (.358), tied for seventh-worst batting average (.244) and eighth-worst on-base percentage (.311) in the majors. The nine players who have hit second for Pittsburgh this year have a combined OBP of .285. Of the 15 players who have had at least 95 plate appearances on the Pirates this season, only Andrew McCutchen (.276) is hitting above .275. In total, the Pirates have scored only five more runs than they have allowed, but they still find themselves one game behind the St. Louis Cardinals for first place in the National League Central with a record of 53-48. Because of their offensive ineptness besides McCutchen, many figure that Pittsburgh needs to trade for another bat to reinforce their lineup if they want to truly stay competitive in the NL Central race. However, the Pirates may find the answer to their offensive issues coming from their own farm system. 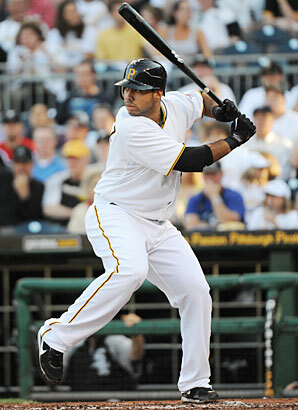 Third baseman Pedro Alvarez, rated the eighth-best prospect by Baseball America before his rookie season in 2010, has been recalled from Triple-A Indianapolis after completing his rehab from a thigh injury. Alvarez is hitting just .207/.282/.296 with only six doubles, two home runs and 11 runs batted in in 38 games this year in Pittsburgh, but he is an extraordinarily talented player who may be able to regain his footing in the last two months of the season as the Pirates prepare for a pennant race. Alvarez’s had a decent 2010 season. He batted .256/.326/.461 with 21 doubles, 16 homers and 64 RBIs in 95 games. However, lost in those total numbers is the maturity Alvarez began to show as a hitter towards the end of last season. In his final 28 games of the year, he hit .318/.362/.598 with 10 doubles, six home runs and 27 RBIs. 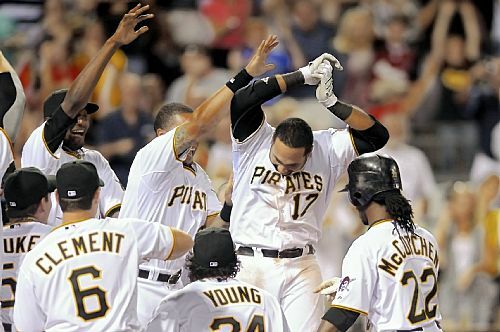 The Pirates certainly expected more of that Pedro Alvarez at the plate going into the 2011 season. Alvarez’s 2011 numbers thus far certainly show he has disappointed the Pittsburgh brass. Had he not been injured and forced to rehab in the minors, it was likely the Pirates would have sent him there anyway. However, in his 25-game rehab stint, Alvarez flashed his dazzling potential at the plate. He batted .325/.439/.538 with three doubles, four home runs and 15 RBIs. He seemed hungry to get healthy and prove to the Pirates front office that he was ready for another chance at the big leagues. Granted, major league pitching is much more difficult to hit than what Alvarez saw in the major leagues. However, he absolutely crushed minor league pitching in his rehab assignment. 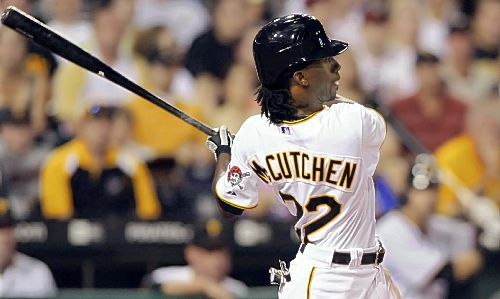 Even including McCutchen, Alvarez is the most talented hitter on the Pittsburgh Pirates roster. He proved last year that he could get hot towards the end of the season. The Pirates may be searching for another bat to bolster their offense as they look to have both their first winning record and playoff appearance in 18 years. They may find all the help they need offensively from right under their nose in Pedro Alvarez. No one in their lineup is hitting over .300. The most wins in a season any of their starting pitchers has ever had is 12. Their closer never had more than nine saves in a single season until this year. Yet, somehow the Pittsburgh Pirates are 45-41, just 1.5 games behind the St. Louis Cardinals in the National League Central as the calendar turns to July. After 18 consecutive losing seasons, including four straight last place finishes in the NL Central, is this the year the Pirates finally enter back into respectability, and possibly even the playoffs? The 2010 Pirates had baseball’s worst pitching staff, finishing dead last in the majors with a .282 batting average against, .798 on-base plus slugging percentage against and a 5.00 ERA. Pirates starters threw just 871.2 innings, allowing opponents to hit .297 while posting a 5.28 ERA, all of which were last in baseball. As a whole, Pittsburgh’s staff has not ranked in the top half of the majors in either ERA or BAA since 2004, when they finished 15th in ERA (4.68) and 12th in BAA (.267). However, the 2011 Pirates staff has been much more effective. Pirates pitchers rank eighth in ERA (3.39), tied for 15th in BAA (.254) and 12th in OPS (.703). 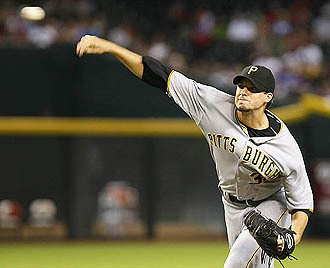 Pittsburgh has no dominant starting pitchers, but Paul Maholm (18 starts, 5-9, 3.08 ERA, 1.129 WHIP in 114 innings), Kevin Correia (18 starts, 11-6, 3.74 ERA, 1.230 WHIP in 113 innings), James McDonald (17 starts, 5-4, 4.40 ERA in 92 innings), Charlie Morton (15 starts, 7-4, 3.63 ERA in 91.2 innings) and Jeff Karstens (15 starts, 7-4, 2.55 ERA, 1.074 WHIP in 98.2 innings) have given the Pirates many quality outings to form a solid one-through-five in the rotation. 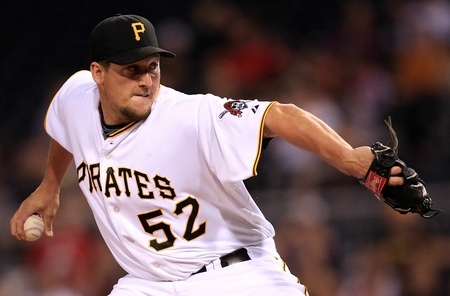 The Pirates’ bullpen has been one of the best in baseball. Ranking seventh in ERA (3.15), 11th in innings pitched (252.1) and 14th in opposing OPS (.679), manager Clint Hurdle has done a very good job of placing his relievers in situations that play to their strengths. Jose Veras (43 games, 2-2, 2.50 ERA, 1.034 WHIP, 40 strikeouts in 39.2 innings), Chris Resop (42 games, 3-2, 3.46 ERA, 1.205 WHIP, 50 strikeouts in 39 innings), Daniel McCutchen (35 games, 2-1, 2.09 ERA, 1.233 WHIP in 43 innings) and rookie lefthander Danny Moskos (20 games, 1-0, 2.30 ERA in 15.2 innings) have all set-up save situations well for All-Star closer Joel Hanrahan (39 games, 0-1, 1.37 ERA, 0.941 WHIP, 33 strikeouts in 39.1 innings). Hanrahan has relied on his slider much less in 2011, throwing it 14.9 percent of the time this season compared to 38.7 percent of the time in 2010. Instead, he is using his blazing fastball almost exclusively, throwing it on 85.1 percent of his pitches with an average speed of 97 MPH this season compared to 61 percent last year. The new formula is working, as Hanrahan has recorded 26 saves this year, more than he had in his first four seasons combined in the big leagues. Pittsburgh needs to keep getting the good pitching it has received this season to stay competitive in the Central. The Pirate lineup has very little pop in it besides the bat of Andrew McCutchen, who is hitting .291/.390/.494 with 22 doubles, three triples, 12 home runs, 46 runs batted in and 15 stolen bases. The Pittsburgh lineup ranks 21st in batting average (.246) and on-base percentage (.314), 22nd in the majors in both hits (702) and runs scored (333), 23rd in home home runs (56) and 26th in slugging percentage (.361). Young and talented players like 25-year old second baseman Neil Walker (.258/.324/.385, 8 homers, 55 RBIs), 24-year old third baseman (currently rehabbing at Triple-A Indianapolis) Pedro Alvarez (.208/.283/.304, 2 home runs, 10 RBIs, 42 strikeouts in 36 games) and 22-year old outfielder Jose Tabata (.265/.351/.354, 3 homers, 14 RBIs, 14 stolen bases) need to start hitting to their potential. The case of Alvarez, rated the No. 8 prospect by Baseball America before the 2010 season, is particularly perplexing because of the way he hit towards the end of last season. In his last 54 games of the 2010 season, he hit .285/.351/.505 with 15 doubles, 9 home runs and 43 RBIs. The Pirates expected more of the same in 2011, but Alvarez was a major disappointment before injuring his quad on May 19. Once he returns from injury, Pittsburgh will need Alvarez to start to hit towards his potential and continue to progress towards being a potential star. With their 5-1 victory over the Houston Astros last night, Pittsburgh is four games over .500, the most they have been this entire season. The last time Pittsburgh was this far above .500 this late in the season was on September 19, 2005. In fact, the Pirates have only been four games above .500 just twice since 2005, with the other time being on April 26, 2009. Their recipe for success has been no secret. Pittsburgh will need to sustain its good pitching throughout the second half of the season to continue to be a threat to the St. Louis Cardinals, Milwaukee Brewers and Cincinnati Reds in the Central. However, with pitchers who largely pitch to contact, opposing hitters’ batting average on ball in play indicates that the Pirates’ staff has been lucky throughout the first half of the season. Veras (.216), Resop (.290), Hanrahan (.262), McCutchen (.269), Karstens (.240), Correia (.272) and Maholm (.253) all have BABIPs well below the league average of .300. While the Pirates have young talent and their organization is certainly taking a step forward towards respectability this season, it is unlikely that Pittsburgh continues to float above .500 and fight in the Central unless the Pirates either suddenly start hitting better or are able to continue to get lucky on balls hit in play throughout the second half of the season. While they have been a great story up to this point, statistics say it is unlikely that the Pirates will continue to be a postseason threat over the final three months of the season.